COLORADO, US — An industry landmark moment has been confirmed today thanks to NREL, Stuttgart University and DNV GL with the control of an operational wind turbine with a ZephIR wind lidar. "This new installation of a ZephIR DM has taken a new direction in reducing yaw misalignment by providing the opportunity for full turbine yaw and ZephIR Lidar control through lidar measurements. Working with a group of experts within each field on this project—wind turbines, controls and lidars—has delivered a landmark moment for the industry and one we are all very proud of. We eagerly anticipate the next steps in Lidar Controlled Turbine," said Andrew Scholbrock, Field Test Engineer at NREL. Further, the usage of the ZephIR lidar system for feed-forward pitch control delivers a reduction of structural turbine loads, enabling OEMs with the opportunities to achieve a lower cost of energy for the industry through more optimal turbine design. The ZephIR DM wind lidar is a circularly scanned, continuous-wave coherent Doppler sensor. Zephir Ltd. notes that the ZephIR DM wind lidar offers unique and unmatched benefits in turbine-mounted applications, from power-curve measurements to full turbine control, as demonstrated in this project. Optimized for installation on a nacelle roof, ZephIR DM generates high-resolution, line-of-sight Doppler measurements every 20 ms through a period of a continuous circular scan of 1 second. Industry research demonstrates that this lidar scan geometry and frequency is very well suited to lidar feed-forward turbine control. The measurements taken by ZephIR calculate various wind field quantities, such as rotor equivalent and hub height horizontal wind speeds, vertical wind shear, wind veer, and wind yaw misalignment relative to the turbine axis at ranges from 10 m to over 300 m out in front of the turbine. These measurements are key to applications such as power-curve measurements, turbine optimization, and end-of-warranty inspections, in addition to turbine control. Continuous-wave lidar and its range-focusing approach ensure high sensitivity, permitting measurements even in the very clear air often experienced at this NREL facility. The ZephIR DM lidar recorded valid signals throughout the 8-month measurement period, operating reliably, without intervention, in a wide range of atmospheric conditions, including heavy blizzards, low cloud, and temperatures down to -22°C. The successful lidar yaw control means that the yaw direction of the wind turbine can be controlled by a lidar, which could lead to a reduction in yaw misalignment and increased power production if the traditional yaw controller has unaccounted errors in it. These errors can include calibration offsets, induced errors by the rotor wake, or due to sensor failures leading to a biased signal, as was the case in this deployment, where ZephIR DM was able to aid in a health-check for the vane sensor and help to target the root cause of the variance in performance. Figure 2 shows the reduction in yaw misalignment using the lidar yaw controller. Further, the successful collective pitch control means that a reduction of the rotor speed variation could be seen of approx. 25% in standard deviation. 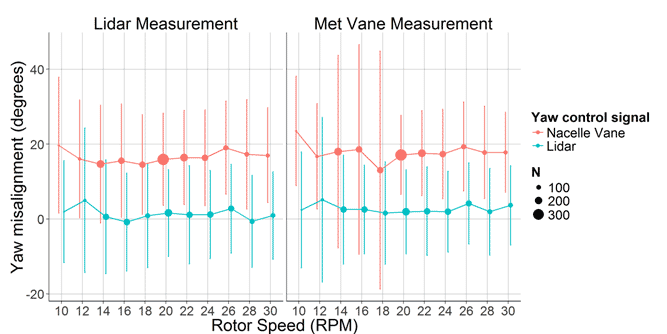 Collectively, the successes of these pitch turbine control experiments have paved the way for subsequent trials on larger, 2 MW class, onshore turbines, and ZephIR Lidar confirms it is already working with major OEMs in this area. "ZephIR is the perfect lidar technology choice for turbine control. For a decade we have invested significant efforts to be the world first in each and every application of turbine-mounted lidar," noted Alex Woodward, Head of Product Development at ZephIR. "Now, with the dedication from NREL, the University of Stuttgart, and DNV GL and their passionate team of industry experts, we can help the sector achieve full turbine control. Additional benefits of load reduction can then also be realized. High-resolution, continuous-wave, coherent technology is second to none in this application, and ZephIR is the only lidar built on this robust, lower-cost laser design." A full paper on this project is available from: research@zephirlidar.com. Campell Scientific designs instruments and systems used worldwide in industry and research. They market the ZephIR 300 and ZephIR DM wind lidars, the best wind lidars in the world, supporting clients with every aspect of a wind energy campaign onshore, offshore, and turbine-mounted. © 2014 Campbell Scientific, Inc. All rights reserved. ZephIR, Zephir, ZephIR 300, ZephIR DM, ZephIR Power and Waltz are trademarks of ZephIR Lidar. Other company and product names may be trademarks of their respective owners.